Mardi Gras is coming up quick, and the beads are rolling in at New York Costumes. When it's Carnival time, you know you've got to get your beads on. Mardi Gras Party Beads. These come in multiple single-color strands of beads, with the various strands being in different colors. In a packaged set, there are 12 strands (necklaces), which include strands in colors: green, purple, gold, red, and blue. In other words, Mardi Gras colors and then some! Mardi Gras Beads. Not unlike the "Mardi Gras Party Beads," but these packages sets of beaded necklaces contain ONLY Mardi Gras colors. So that is 12 strands of only green, purple, and gold. Beads are of the 7.5 mm size and come on necklaces that are 33 inches long. Mardi Gras Braided Beads. Three strands of the classic Mardi Gras colored beads - green, gold, purple - braided together to make a multi-colored necklace. For extra decadence and for that extra special bead-earning reveler. Classic style with some added pizzazz. Dis co Ball Mardi Gras Beads. Mardi Gras beads but with each individual bead in the shape of a mini disco ball. These beads are a little larger and the strands are a tiny bit heavier. So many variations are available on the classic green, gold, and purple beads. Imagine digging through piles and piles of these shiny beaded strands. That's what we've been doing over here in the East Village at the costume shop. And this is only the tip of the iceberg! Onward into Carnival Season! Just in at New York Costumes, some neat little birthday candles with some extra special flare. Flare as in style, and flare as in flame! 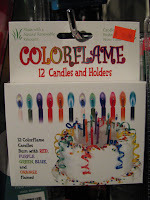 ColorFlame Candles burn with flames in a variety of colors. 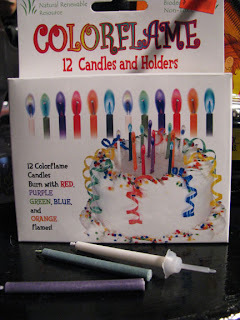 Light the wick, and watch the flame light up in either red, purple, blue, green, or orange. 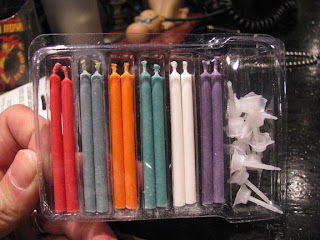 These candles come in sets of 12, with two of each color and a plastic holder for each candle. Each candle is 2" tall and burns for approximately 8 minutes. A great way to add flare and style to a birthday cake, celebratory baked goods, or other project calling for tiny candles. Scanned from the Daily News, Wednesday, Jan 6. The caption mentions that Ashlee Simpson and her husband got these masks with a "little help from a downtown costume shop." 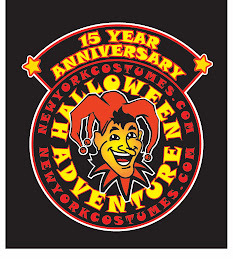 That would be us at New York Costumes, the downtown Halloween Adventure. 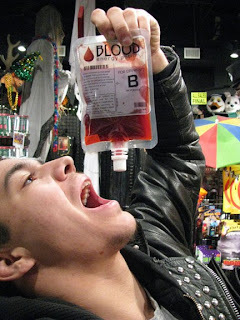 People's blood isn't for drinking, but Blood Energy Potion is! 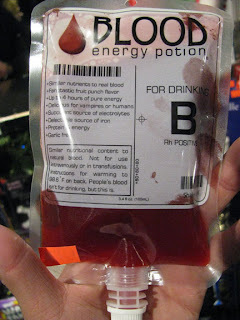 Blood Energy Potion is a new, creepy product that just arrived at New York Costumes. 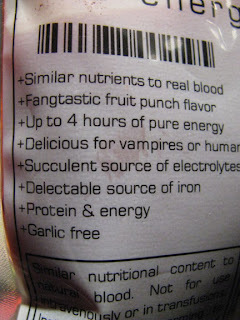 This drinkable, fruit punch flavored packet of blood-like goodness has similar nutrients to real blood and is at the same time a "succulent source of electrolytes." Rip it open, pour it all over your face, and lap it up. That is, if gore in on the menu for your fright fest or carnival of blood! 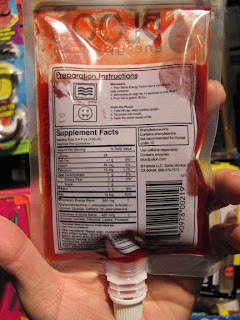 NOT to be used for transfusions or intravenously, but great for making a bloody mess that you can consume.